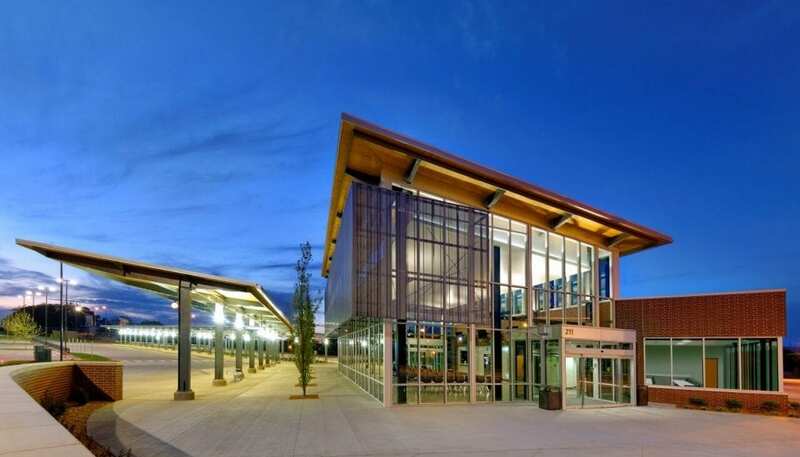 City Utilities Bus Station 2016 Developer of the Year | DeWitt & Associates, Inc. Accompanied with an innovative exterior design, City Utilities insisted that their new structure delivers a safe and efficient environment for their customers and employees. Improvement focus areas for the transit center include; accessibility for universal needs and disabilities, ticketing kiosks, City Utility payment kiosk, large screen televisions for displaying route information, weather and news updates, Wi-Fi accessibility, bike repair station and bike lockers, driver’s lounge, public USB charging stations, indoor and outdoor seating, multiple platform bays equipped with technology for displaying route information—all coinciding with the updated bus routes around the city.